Two small stoneware bowls, each with a sturdily potted body supported on a low splayed foot. The steeply rounded sides straighten and curve in at the rim. 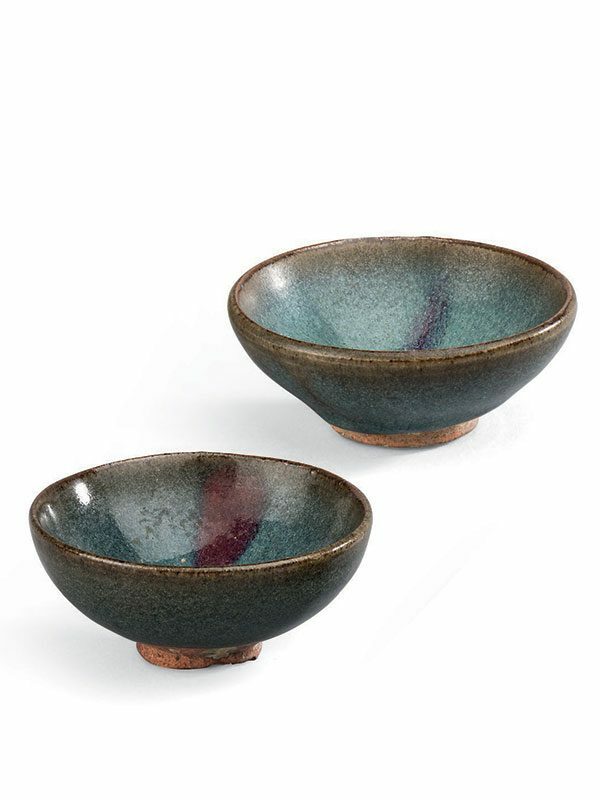 Each bowl is covered in a blue glaze that turns a transparent olive-brown tone at the rim. The interiors are enlivened by a single splash of purple and reddish purple that extends from the rim to the centre of the bowl’s interior. On the exterior the glaze stops short of the unglazed foot, where it pools in thick drops. The unglazed stoneware is fired to an orange tone, with some small specks of grit attached to the base and the foot.